It was a good week for Quinnipiac hockey as they are off to their first 3-0 start since the 2015-2016 season after beating UConn in its home opener 4-2 followed by a 1-0 shutout win over 18th ranked Boston College. The start by Quinnipiac has propelled them back into the rankings. They are 20th in the USCHO.com poll, 15th in the USA Today poll and 3rd in the ever important pairwise rankings. All in all its been a great start to what we all hope will be a turnaround season. Now let's take a look at how some future Bobcats did over the past week. Goaltender Evan Fear of the Green Bay Gamblers posted his first career USHL shutout in a 43 save 1-0 win over the Dubuque Fighting Saints. Fear on the season is 3-2 with a 2.59 goals against average and a .924 save percentage in five games played. He picked up the USHL goaltender of the week award for his strong performance. Logan Britt picked up a lone assist over the weekend for the Lincoln Stars. The defenseman has a goal and three assists in eight games played so far this season. Justin Robbins went 1-1 over the weekend in goal for the Chicago Steel bringing his season totals to 3-3 with a 4.12 goals against average and a .863 save percentage. 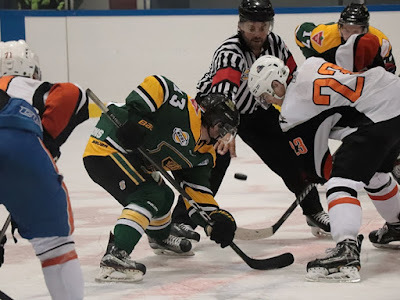 Matt Fawcett had a five point weekend in three games played for a the Powell River Kings. He had three goals and two assists to help Powell River to two wins over the weekend. He is the teams second leading scorer with 16 points (6 goals, 10 assists) in 15 games played. Quinnipiac picked up a new commit out of the BCHL over the weekend when Matt Fawcett's teammate Jayden Lee committed to Quinnipiac. The 2001 born defenseman is in his second full season in the BCHL. He picked up a goal over the weekend for Powell River and in 15 games played has 6 points (1 goal, 5 assists). Neutral Zone ranks him as a 4 star prospect. Tyler Ghirardosi had an assists in two games played for the Trail Smoke Eaters. In 15 games he has 10 points (5 goals, 5 assists). Skyler Brind'Amour picked up two assists in three games played over the past week for the Chilliwack Chiefs. In 18 games played he has 12 points (3 goals, 9 assists). Corey Clifton had a really good week for the Surrey Eagles picking up four points (2 goals, 2 assists) in three games played. He is 4th on the team in scoring with 10 points (3 goals, 7 assists) in 18 games played. PJ Fletcher picked up his second assist of the season over the weekend for the Wenatchee Wild. In 15 games played he has two assists for the season. Wyatt Head picked up another two assists over the week in three games played for the West Kelowna Warriors. In 16 games played he has 12 points (3 goals, 9 assists). Nick Kent had a three point week for the Buffalo Jr. Sabres with a goal and two assists. In 17 games played the California native has 11 points (2 goals, 9 assists). Victor Czerneckianair had a 10 point week for the Selects Academy U-16 team at the South Kent School. The Southington, CT native has 36 points (18 goals, 18 assists) and is second on the team in scoring. Oscar Plandowski had two assists this past week for the Selects Academy U-15 team at the South Kent School. In 19 games played he has 24 points (4 goals, 20 assists). Jack Silich is up to 44 points (19 goals, 25 assists) in 28 games played for the Chicago Mission U-15 team. Liam McLinskey had three points in two games for the Jersey Hitmen U-18 team. In 9 games played he has 10 points (6 goals, 4 assists).